Here at Who What Wear, we’re constantly sharing new brands we’ve discovered via Instagram, affordable brands with the best fashion finds, the most stylish things you can (surprisingly) score on Amazon, and more. In today’s feature, we’re spotlighting the new designer bags at the top of our spring shopping list and purchases to tell our friends (and dear readers, of course) about. If you’re in the market for a new luxury purchase, meet the highly recommended handbags our fashion editors are eyeing. Since a brand-new designer bag isn’t in everyone’s budget, each month we also share the top luxury pieces you can find on resale sites like The Real Real for a fraction of the price. While today’s selection features the silhouettes and styles at the top of our shopping wish list from coveted brands like Prada, Burberry, and The Row, later this month we’ll be sharing similar (pre-owned) styles you can buy off TRR, so stay tuned. In the meantime, see and shop the new designer bags everyone should know about this year. Be sure to show us how you’re wearing your handbag this season by using the hashtag #WhoWhatWearing on Instagram. "Everything about this new The Row bag is genius (including the name). I love that you can wear it several different ways, and the size is perfect. I'm sure it'll start selling out any day now." "I have an older version of this raffia tote from Loewe, but the updated version has these cool, chainlink straps that are making me seriously jealous of whoever gets to wear it." "I am a sucker for a classic Chloé bag, and this one is no exception. The wide strap, gold rings, and different shades of neutrals give it a modern touch, making it the obvious choice for my wish list this season." "Riccardo Tisci's first collection for Burberry is starting to drop—including the new TB bag, which I can't wait to get my hands on. The minimal design and structured shape are exactly what I want in my closet." "Prada's new Sidonie bag is quite the beauty, it's a fresh design on a classic shoulder silhouette that's in the spotlight right now. I've also spotted a couple available for the waiting list on TheRealReal if you're looking for the red or black style." "The larger-than-life tote bags that sashayed down the spring runway at Stella McCartney are the perfect choice for my bag lady tendencies. Wear it held-at-the-hip for a cool girl look." "Markarian is one of my favorite designers right now, and this floral bag couldn't be any prettier. I would be tempted to keep it front and center on my dresser so I could look at it every day." 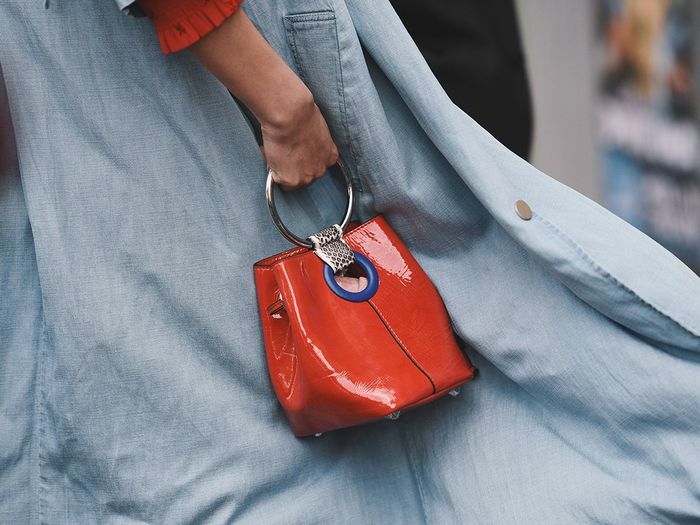 "A few scrolls through Instagram will confirm that Chloé's Tess bag has emerged as the latest must-have designer bag, so lucky for us, the outfit ideas are plentiful. I particularly love how the bag's smaller size is contrasted by the wide straps which you can wear a number of different ways." Up next, shop 20 designer bags that are under $200.